Find Your Relatives Badge Number! The badge awarded to all who passed with the 1st Independent Polish Parachute Brigade was serial numbered on the back. 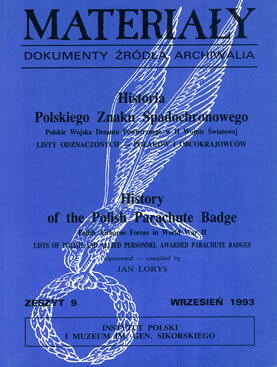 All of the badge numbers along with the person the badge was awarded to are listed in a book called "Materialy - Dokumenty Zrodla Archiwalia" By Jan Lorys. Unfortunately, this book is EXTREMELY hard to get hold of and typically costs £130. I am fortunate to own a copy of this book. I'm happy to lookup your relative in exchange for a donation (minimum £10). This money goes towards the running costs of this site (Such as buying a £130 book!). Detail of whether in "Operation Market Garden"
If you wish to see a copy of your relatives badge details please FIRST make the donation. Then use the contact form and provide your relatives details to me. I will then email you a photograph of the relevant listing.